I had the honor of attending the VMUG Leader summit on Dec 2 – 4th. The summit was held at VMware HQ in Palo Alto. There were 91 local VMUG leaders that attended the event. Having so many VMUG leaders in one location was very valuable. I want to thank VMware VMUG HQ staff for coordinating the event and thank VMware for hosting this awesome event. The purpose of the summit was to share ideas and learn additional methods to enhancing local VMUG’s. There was a jam packed schedule of events. I arrived Wednesday and there was a reception that evening. It gave all the leaders a great opportunity to hang out and meet other leaders. On Thurs we had a jam packed day. To start off the General Session Brad Tompkins (VMUG CEO) welcomed everyone and let us know what was going to happen that day. He also announced that VMUG will have a European office starting in 2016. Next Mariano Maluf (VMUG Board President) talked about what was going on with the VMUG organization. 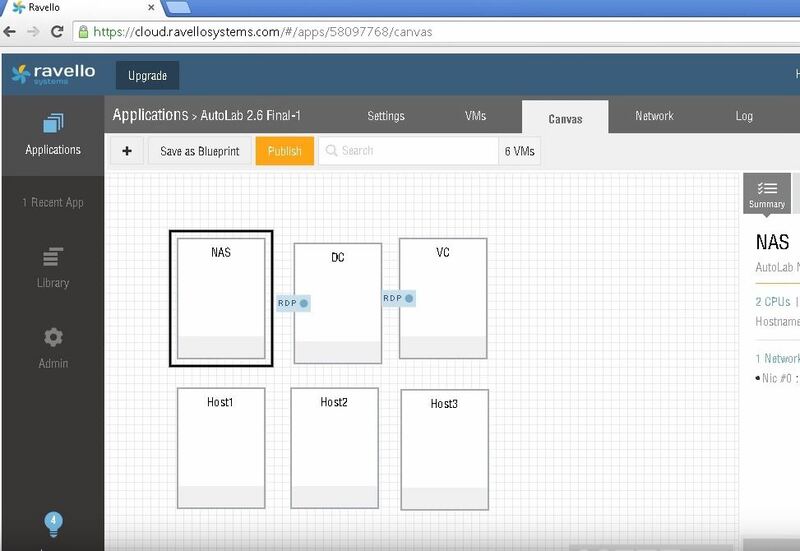 Last, Guido Appenzeller (CTSO for NSXBU at VMware) gave a presentation on NSX. These sessions were designed to give us the tools and information to better run our local VMUG’s. These sessions also initiated a lot of discussion about what worked and what was not working at each leaders local groups. It was great to hear other leaders share their experiences. After two of the breakouts we had lunch and then Kit Colbert (VP & CTO of Cloud Native Apps at VMware) gave the afternoon keynote on Software Defined Everything. It was really focused around DevOps. Kit is a great speaker and did a great job presenting. Surprisingly it was raining off & on Thursday, but we were given a tour of the Vmware campus after the UserCon session. The VMware campus is huge and very beautiful. VMware is a very green company, so everything was designed with that thought in mind. The campus tour was awesome, but we had one more breakout session to attend. After that breakout session we walked across the VMware campus for a “VMware Demo Showcase”. VMware engineers from different product groups had demos setup for us to watch and ask questions. About half way through the Demo Showcase we had a huge surprise. Pat Gelsinger stopped by with one of his good friends Michael Dell. Michael talked for a few minutes and then him and Pat had to leave. It was a highlight of the day for me. The Demo Showcase was great, but it was late in the day and I was tired, so after we went back to the hotel, I did not stay at the reception for very long. There was a lot of food and drinks. Friday was only scheduled for half a day. We had a great breakfast that morning – lots of BACON! The morning was kicked off with a panel discussion from four VMUG leaders about what they had learned from the summit. I was honored to have been asked to be on the panel. Pat Gelsiner returned Friday for the last General session. He spoke about different VMware topics and then answered some questions from different leaders. Robin Matlock (CMO at Vmware) stopped by and spoke briefly about some marketing initives going on at VMware and then answered a few questions. Brad Tompkins closed the summit by inspiring all the leaders to take what we learned and apply it to our local groups. Overall, I thought the VMUG Leader Summit was a huge success. I learned a lot from all the sessions and I learned even more from all the discussions going on between different leaders. Check out all the Pictures from my VMUG Leader Summit trip. Being a VMware vExpert, I decided to use the free 1,000 CPU hours per month to run VMware ESXi labs or VMware workloads in AWS or Google cloud to test out the newest version of Bitdefender Gravityzone on VMware vSphere 6. If you are not a VMware vExpert Ravello still provides a free trial period. Click Here to check out more information about Bitdefender and download a free trial. I did not want my DC & VC exposed publicly, so I removed public RDP access and added a WIN 7 VM as a jump box. I also added three more ESXi hosts to my blueprint. Once the NAS, DC, VC & WIN701 VM’s were built, I modified the PXE boot menu so I could build more than 3 ESXi hosts. You just have the modify the .cfg files in the TFTP-ROOT dir on the DC. After I had all the ESXi hosts were built and added to the cluster, it was time to install and setup VMware vShield since I was going to be testing agent-less AV. This site has good instructions on where to download and how to install vShield. 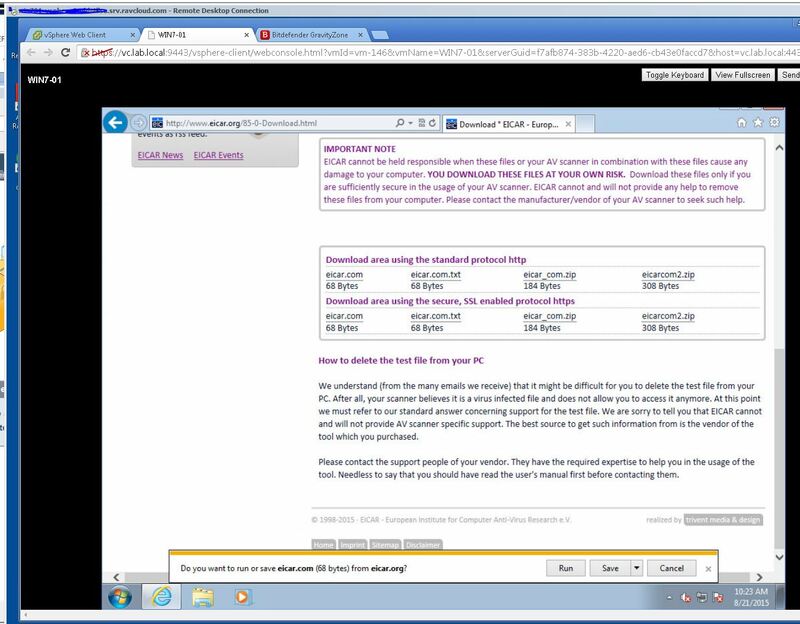 Once you have vShield installed and endpoint installed on all the hosts, vShield should look like this. Now that vShield is deployed and all setup it is now time to deploy Bitdefender Gravityzone. You can learn more about Bitdefender and download a free trial from their website. You can download the installation guide and follow it to install and setup Gravityzone. 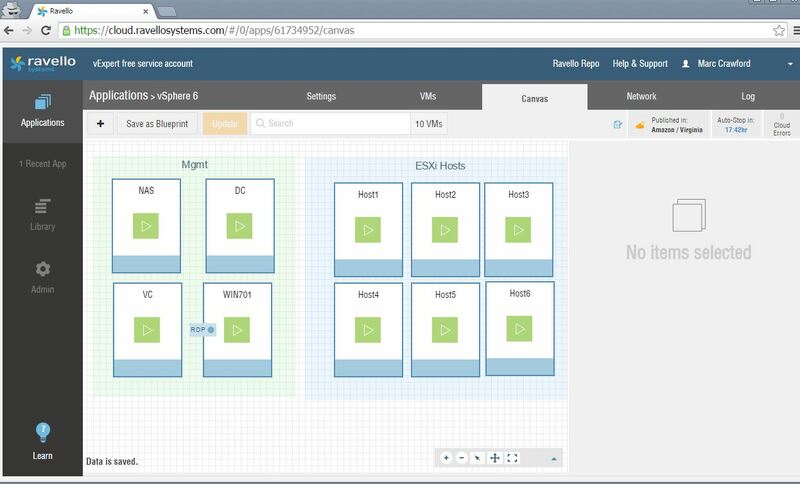 Once you have Gravityzone installed, then you can deploy the security appliances to each ESXi host. In the picture below you can see I have the security appliance applied on each ESXi host and they have their own special icon. After vShield and Bitdefender was installed, I installed a Windows 7 VM on one of the ESXi hosts. 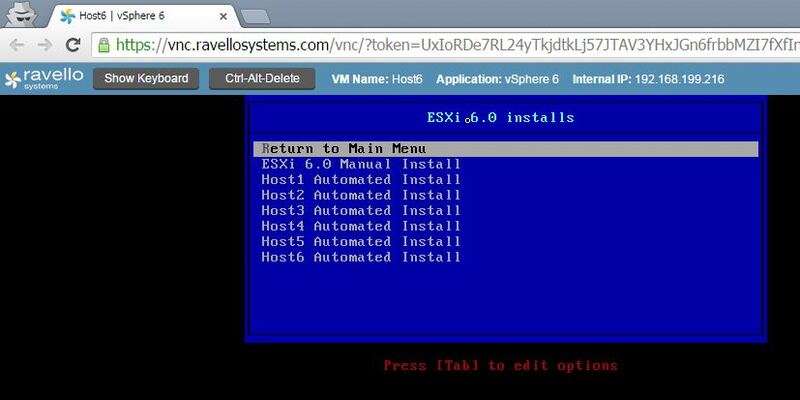 It takes a little longer to install because it is nested on an ESXi host that is nested on Ravello, but it works. 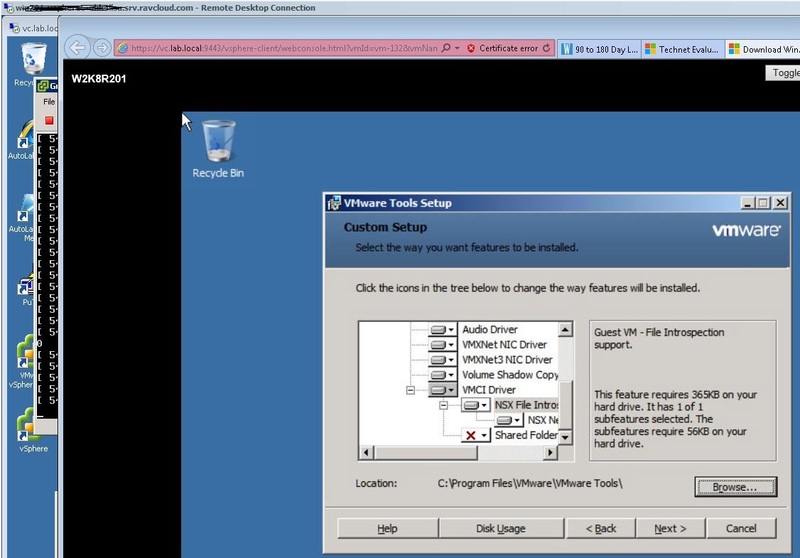 After Windows 7 is installed, I installed VMware Tools. For agent-less AV to work, you need to enable Guest Introspection. Now that everything is installed, it’s time to test it out. You can go to the eicar website and download the eicar.com file. I always save the file as eicar.txt. I then open it and it should be blank. Then you can log into Gravityzone and go to the dashboard. It should show that it resolved an issue on one VM. Bitdefender is a good solution for virtualized environments. You can use vShield agentless solution and deploy security appliances on each host or you can deploy the Bitdefender agent on each VM and have one security appliance that all the scanning is offloaded to. Ravello made all this testing a lot easier since I did not have to setup any hardware, but my free 1000 hours did run out faster than I thought. I will need to keep a closer eye on the number of hours I use each day. 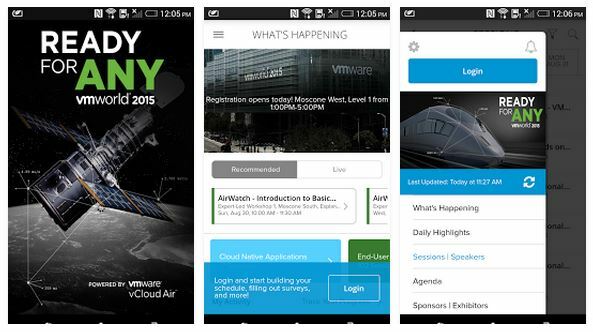 VMware has posted the VMworld 2015 Apps on the Google Play Store and Apple App Store. Go download them now. One of the cool features of the app is that when you look at your schedule, it will tell you what building and room a session is in. VMworld 2015 is just around the corner. This will be my 4th year attending. It is not too late to sign up. Click here to sign up. There are a lot of posts out there with lots of tips, so I am going to list a few that I have not seen list. Do not use your work email address to sign up for VMworld. Very difficult to get the email address associated with your account changed. Have Fun. Don’t fill your day with attending sessions. Create a separate calendar just for VMworld schedule. I used gmail and it is very easy to create a separate calendar that overlays on top of your regular calendar. Below is a collection of VMworld Conference Tips posts by some great bloggers. Check them out.